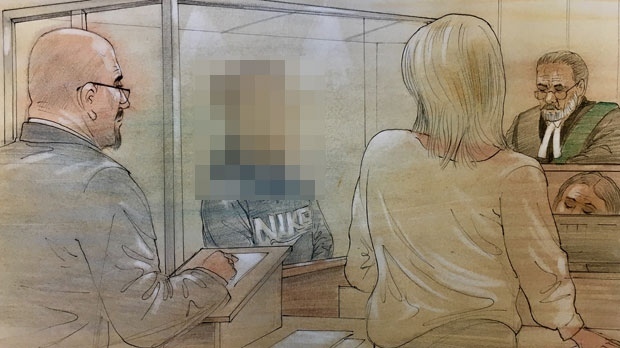 A 15-year-old accused of fatally stabbing a teen near Sherway Gardens mall appeared in court on Tuesday wearing a bandage on his hand and moving as though his back was injured. The stabbing occurred on Saturday around 9:45 p.m. near The Queensway and The West Mall. Police say that a man, 19, and two 15-year-old boys were found near a bus stop “suffering from trauma.” All three were transported to the hospital for medical treatment. One of those 15-year-old boys was pronounced dead at the hospital after suffering from a life-threatening stab wound. Police identified the victim as Jack Meldrum of Mississauga. The other boy was taken into custody on Monday and was charged with second-degree murder. He cannot be identified under the Youth Criminal Justice Act. In a Facebook post, Meldrum’s father, Steve Meldrum, confirmed that his son was the victim of the fatal stabbing. Another relative identified as Kelly Meldrum also posted to Facebook to shine a spotlight on the teen’s love of his family. The 19-year-old man who was also injured in the stabbing remains in hospital in serious condition. The accused appeared in front of a judge Tuesday morning. His lawyer confirmed to CTV News Toronto that he was suffering from a back injury. The teen will remain in police custody until his next court date on Sept. 18, where he will appear via video. Jack Meldrum, 15, is seen in this photo provided by Toronto police.